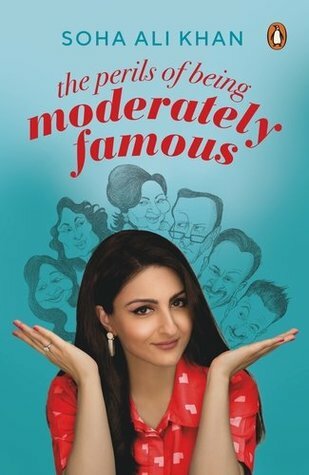 The perils of being moderately famous is a debut book of the author. Soha Ali Khan is a Bollywood actress. This book is an autobiography. It collects the moments she shared with her family and friends. Soha's family is well known in India. She is a star kid. Her father Mansur Ali Khan Pataudi was a well-known cricketer. Her mother Sharmila Tagore is also a Bollywood star and a distant relative of Rabindranath Tagore. Her elder sister Saba is a jewelry designer. Her elder brother Saif Ali Kahn and sister-in-law Kareena Kapoor Khan are well known in Bollywood industry. Pataudi family belongs to royal bloodline. This book is divided into different parts where the author tells about her family member. This book is a tribute to her family. The book starts with her father's story. How he achieves all the stardom and her relationship with him. Soha was with him when he took his last breath. She explains how she felt at that moment. In the next chapter, she describes her mother Sharmila Tagore's Bollywood journey. Back in days, inter-caste marriages were uncommon. Sharmila Tagore married to a Muslim Prince which is a big deal. The author didn't talk much about her elder sister, Saba. "We travel because we know we will come home and when we do, home is the same but we are changed and that changes everything." She tells about her education and experienced at Oxford University. Back at home, she had a lot of people to do her work. But in the hostel, she had to do everything by herself. She tells about her trips and hitchhiking experiences which changes her perspective. She worked at Citigroup Pvt. Bank in Mumbai as a Management Associates but faith wants something else. She started her Bollywood career in 2004 by Dil Maange More. She worked in many movies but she didn't get much stardom. She shared her experience that how people ask about Saif and Kareena's child wherever she goes. She falls in love with Kunal Khemu and ties a knot with him in 2014. He is also a Bollywood actor. They first met at the film set. Their love story is the only part which I enjoy the most. I really like how she describes her pregnancy part. One can feel that excitement by reading that part. The author's writing is flawless. But she put a story in a jumbled way. One can easily be confused. She talks so much about her father's achievement rather than her own. I know she didn't accomplish much. But I really want to read more about the author rather than her family. There is no gossip about Bollywood and no family drama which is good. It's a fast-paced story. From growing up as a modern-day princess to her days at Balliol College, from a daughter to be a mother. She describes everything. The author tells her touching moments of her life. How it feels like growing up in one of the most known families of the country. In this book author's family photos are also published. It's a one time read. If you are a Bollywood fan and want to know about Khan's family then you must read it. It's a fun read. What is it like to be known as Mansoor Ali Khan Pataudi's daughter? Or to have a mother as famous as Sharmila Tagore? Or to be recognized as Saif Ali Khan's sister? Or as Kareena Kapoor's sister-in-law? And where do I stand among them? Soha Ali Khan is an Indian film actor who has appeared in movies such as Rang De Basanti, Tum Mile, Khoya Khoya Chand and Sahab Biwi Aur Gangster Returns. She studied modern history at Balliol College, Oxford, and earned a masters' degree in international relations from the London School of Economics and Political Science. She is the youngest daughter of actor Sharmila Tagore and Mansoor Ali Khan Pataudi, the ninth Nawab of Pataudi. Both her father and paternal grandfather, Iftikhar Ali Khan Pataudi, were former captains of the Indian cricket team. Her older brother is Saif Ali Khan and she's married to actor Kunal Khemu.